Prachuap kiri khan province lies along the east coast of upper southern part of Thailand for hundreds kilometers from Hua Hin to Bang Saphan. The province coastline is long and beautiful and offers great travelling opportunities . The most famous places are along the coast are Noi Bay, Prachuap Bay and Manao Bay which lines next to each other from north to south. Prachuap kiri khan is also known in Thai as “Muang Sam Ao” or the city of the three bays. 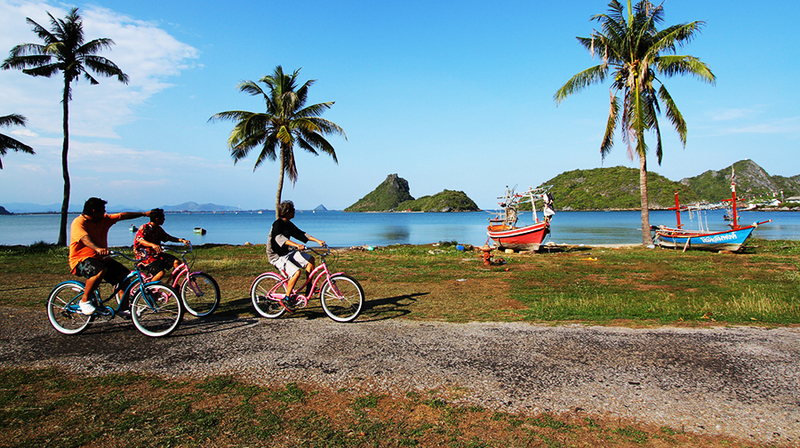 Our bicycle tour will take you to visits the best spots of Prachuap Kiri Khan, stopping every now and then to take time to enjoy the beautiful nature and spectacular sceneries. Most of the route is a smooth asphalt road running along the beach. One of the highlight of this tour is a visit at a local temple surrounded by a Naga (mythological dragon) which chapel has amazing carved wood works. There is a great contrast during this tour while we cycle through the city to quiet beaches. We will encounter wild life and you will be surprised to be able to spot the rare Dusky langur right in town. We leave the city to the beach for lunch and then cycle through the 3 bays. there will be plenty of opportunities to get a swim along the way, just choose your spot between the three amazing bays... later during the day we then take you back to our office. We will pick you up at your hotel in Hua Hin at about 7 o’clock in the morning. It will take us about an hour to the starting point in Ao Noi, a quiet bay where are anchored traditional Thai fishing boats. From there we will head for the second bay, Prachuap bay the longest one and then on to the third one : Manao bay. We will have a spare time for 45 minutes to an hour to enjoy swimming in the warm water before heading back. You will be dropped off at your hotel around 4 pm. All family trip, suit everyone who knows how to ride a bike we cycle about 15km. on flat, anyone who can ride a bike can do this ride. we use imported 7 speed TREK cruiser bikes or GT/TREK MTB. 24-27 speed.